Never has gluten free eating felt so normal as it has over the last year. It seems everyone is moving in leaps and bounds to make a substitute in everything! I saw these rolls in Devon but it was on my last day so I didn't want to bring them all the way back! But I have only just managed to find them in stock in my local shop! In packs of four, these rolls are perfect to cover a whole week of lunches for work as there's not too many so they don't go off before you manage to eat them all! I also think that for £2 is a fantastic price as this is only 50p per roll. There are 208 calories per roll and 1.8g sugar, which I think sounds like quite a bit, although there is 3.2g fibre, which in all accounts is quite high for a white bread roll, which is fantastic and it is low in salt. I find most things are fine in moderation but I do like to check as sometimes free from food have a habit to surprise! I guess there needs to be a compromise somewhere! 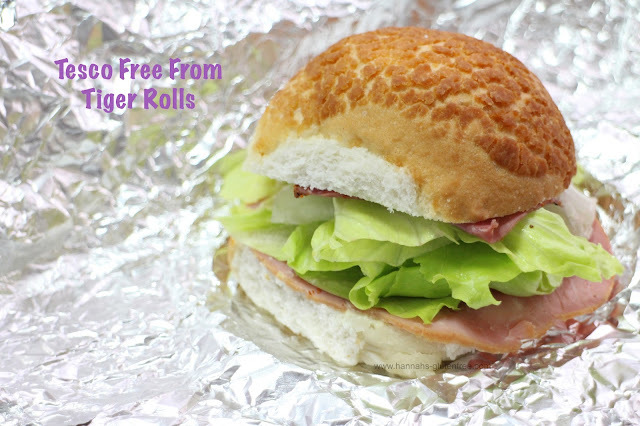 Free from milk, wheat and gluten, these rolls do not compromise on flavour, they have a great texture and do not need to be filled with sandwich fillers that would add moisture to distract from dryness, as there isn't any. Flavour wise, these rolls obviously do not have the fresh mainstream bread flavour, but at the same time they are not noticeably gluten free, there is not an odd aftertaste and they even look right! There is a light sweetness to the bread, but not overly so , mainly on the top and sides, where I believe there is an egg glaze. The texture is more dense and have visible air pockets, but these are like size of an Areo bar bubbles, there is no huge holes and they are quite light so are not stodgy and too much. Tapioca Starch, Water, Rice Flour, Potato Starch, Rapeseed Oil, Humectants(Glycerine), Psyllium Husk Powder, Dried Egg White, Yeast, Thickener (Hydroxypropyl Methyl Cellulose), Dextrose, Potato Fibre, Salt, Preservative (Calcium Propionate), Sugar, Emulsifier (Mono- and Di-Glycerides of Fatty Acids). You are also able to freeze these roll, so if you would prefer to save these as you cannot eat the same thing everyday like myself, it is ok to freeze these, although I do not know how they will change in texture once defrosted. This week I have not only had these with soup, but my new favourite lunch is one roll with some cured ham, butter and iceberg, simple I know, but these rolls are so tasty and it all compliments one another beautifully. When I first changed my diet , you only found tiny loaves of dry bread, so it's fantastic so much is becoming available!